Shamanism is the ancient practice used by indigenous or native peoples around the world for healing of humans, animals, and the natural environment. Modern remembering of this ancient wisdom is being done today through Core Shamanic techniques brought from these ancient practices. Shamanism is a connection with the elements of earth, air, fire, and water. It is a connection with all of the other elements on this planet. It is a connection to our spiritual ancestral heritage and our spirit guides. Our spirit helpers or guides are called upon to assist us in our healing. They are remembered each day in order to help us move through our daily lives firmly grounded on the earth and at the same time connected to the spirit that is us. Have you ever had that feeling that you are not all here or that you feel fragmented? During times of trauma parts of our spirit leave us to keep us safe. Soul Retrieval work brings back those parts of self which left us and might be ready to return. Have you had that feeling that your are not yourself, like there are other thoughts and feelings with you that are not typical of who you know yourself to be? We are influenced at times by other energies that do not belong to us. There are sometimes lost souls who get stuck here rather than moving to the spiritual light. These are sometimes just thought or random energies that get stuck to us. They don’t normally mean us any harm, but they also don’t belong stuck here. This is called Extraction work. If you know of family members or friends who have died traumatically or without closure, and you notice that their energy seems to be with you at times, it might be beneficial to have Psychopomp work done. This compassionately redirects them to move toward the light where they will be welcomed and healed. A steady drum beat or rattling is used to connect to the frequency vibration that is best to reach a mental state of connection with the higher wisdom we all have. Drums and rattles have been used historically to bring people to a connected state with each other, our ancestors, and with all of nature. 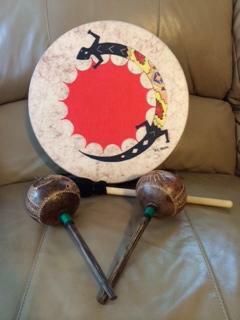 Shamanic Healing Session – 1 1/2 hours – $150.